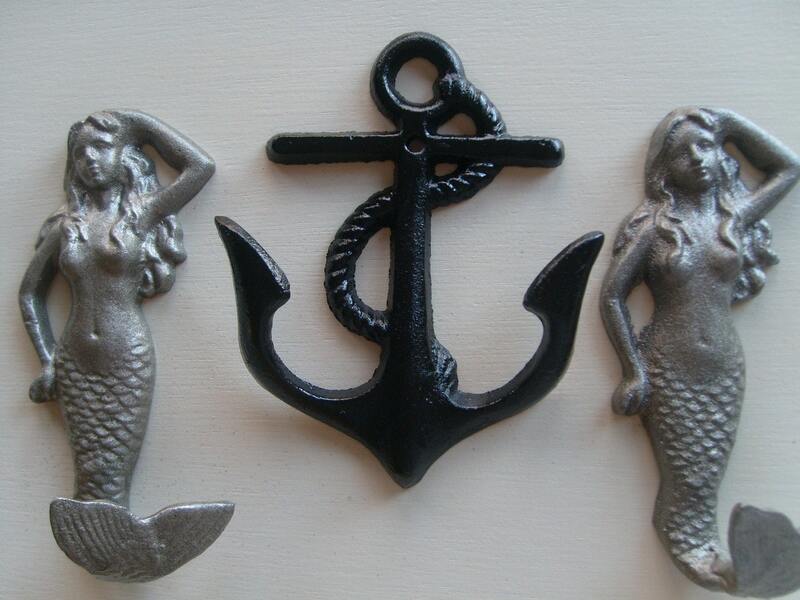 These 2 mermaids and one anchor hook are the perfect way to get organized~ this classis color combination came from a customer's custom order request. 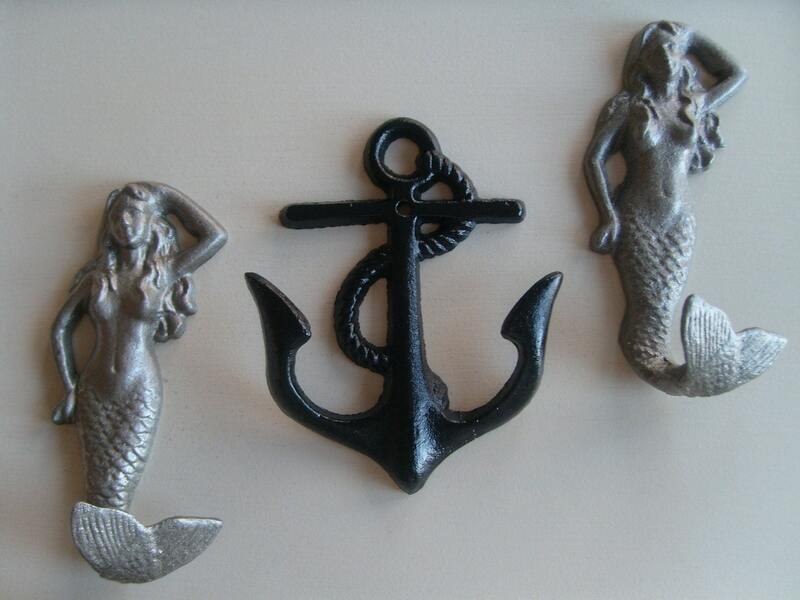 So, this listing is for ONE Anchor hanger, and TWO mermaid hangers, all unmounted hooks, but you choose your own colors. 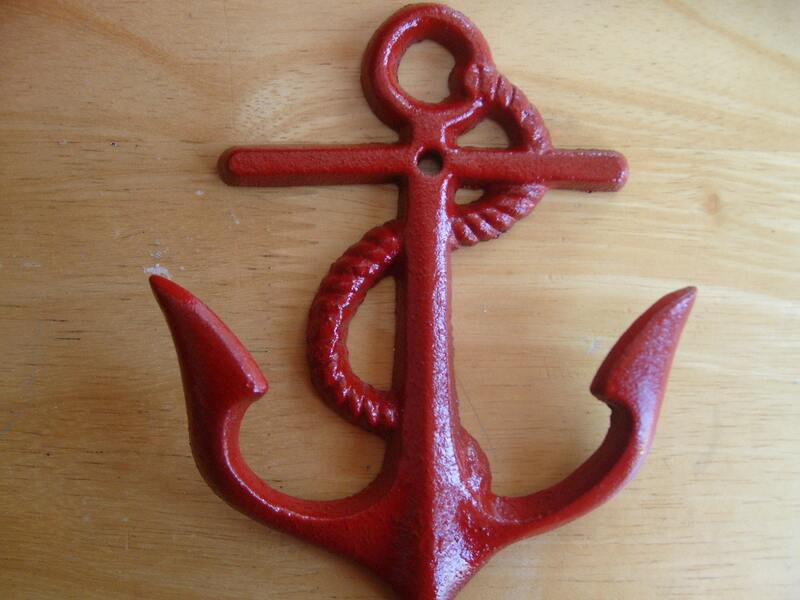 As featured on the front page of etsy, this anchor hook has been popular for those who love the water~ Every sailor needs someplace stylish to hang his/her hat! I was so pleased when I found these at one of my fav antique/consignment stores~ this all began when I found a fleur de lis hanger, which sold before we could get it mounted on wood. I now sell the various hangers as is, painted, or painted and mounted by us on reclaimed wood or premium pine lumber. We have other styles and colors available, so take a moment to browse while you're here. 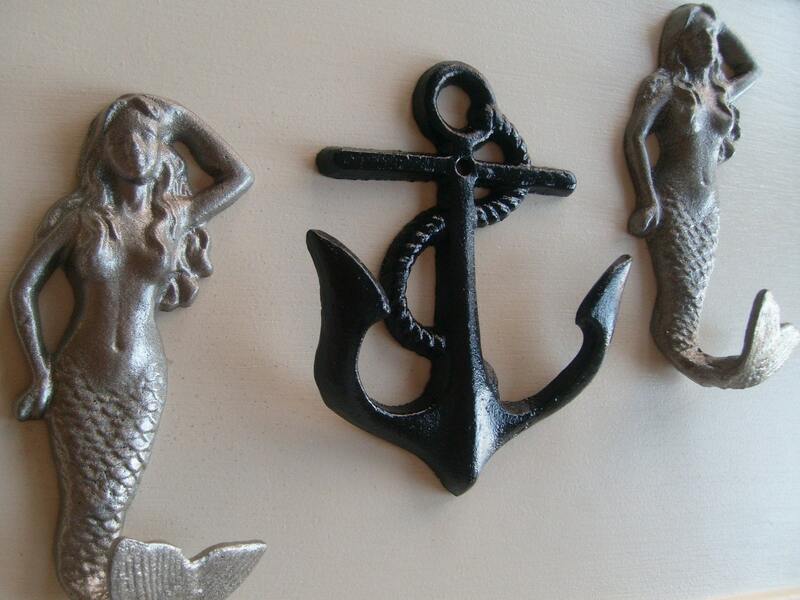 The anchor hanger has a double hook, so it is chic and practical. It measures almost 4 1/2" wide, and is 5 1/2" tall. Made of cast iron, it's sturdy enough to hold moderately heavy items. All you need is 1 nail or screw and your sylish decor is done. The mermaids, the most popular style I have shown here, use the tail for a hook, and they measure 5 3/4" tall and almost 3" wide. 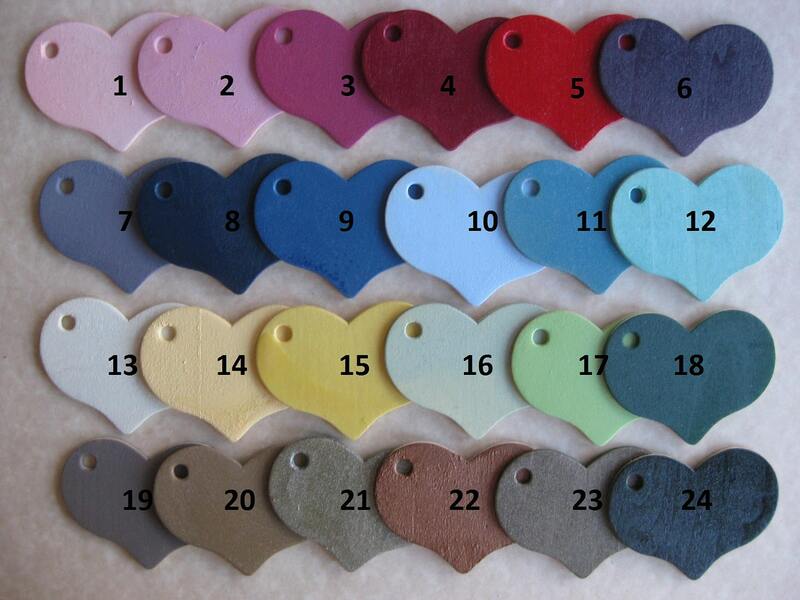 Please remember to specify your color choice and also let us know if you want your hooks distressed or not as you check out. Contact me with any questions you may have. Thanks for stopping by, and have a blessed day! These are so beautiful. Go great with my beach house/ tropical decor. Thanks so much. Really nice items. The anchor looks small but holds two full sized towels and the mermaid hooks are perfect for holding one large towel each. Little snafu with the shipping but they addressed and handled the situation ASAP. Would recommend shop. The item came in shipped on time as I was told and they look great. They have a nice solid feel and will look amazing in our new nursery. What a find! My husband is a fan of everything nautical and though I was a bit behind on prepping for his birthday, this vendor was able to get these hooks out to me in record time. They're perfect and will look fantastic in our entry way.